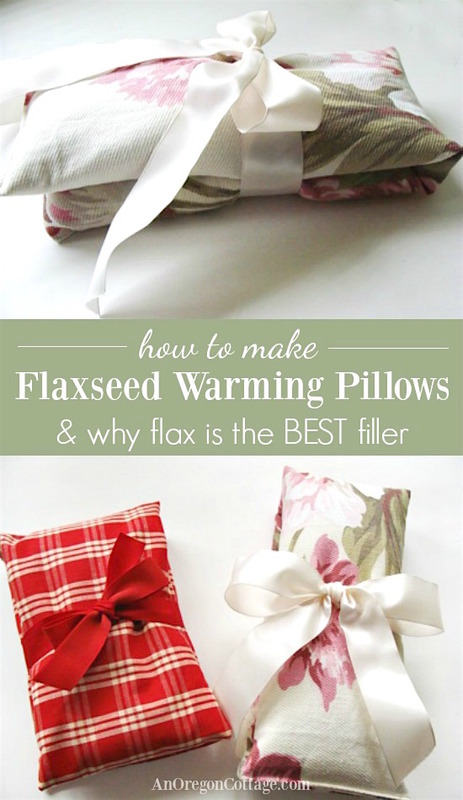 A complete tutorial showing how to make flaxseed pillows, a popular and welcomed gift, plus WHY flax seed is the best filler for homemade warming pillows. Check out more DIY gifts on the handmade gifts page. Note: in addition to the tutorial below, you can also go here to watch a video tutorial to make these homemade heat pads filled with flax AND download a set of printable tags with directions for using! My entire extended family loves using these easy-to-make flaxseed pillows for everything from sore necks to foot warmers (on cold nights it’s a treat to slide into bed with warm toes!). They have been one of the most popular handmade gifts I have given, as well as one of the most popular things I sold when I had a craft business. And the fact that they are super easy and inexpensive to make is just a nice bonus! While you may think that rice or corn would work just as well – and be cheaper – as a filler for DIY warming pads, there are lots of reasons why flax is better. For a heating pad with lasting quality, using whole flaxseeds is really the only way to go. Why flax instead of other grains? Flaxseed provides a gentle, moist heat which promotes healing. Flaxseeds are flower seeds, rather than grains, so they contain 30-40% oil which remains inside the seed to be warmed again and again. Other products lose their ability to retain heat as the water cooks out of them over time. When heated, flaxseed pillows retain half their heat after an hour. Under covers (think about those toes…) the pillow will still be warm hours later. Flax never has that “cooked grain” smell other grain based products have when heated over and over again. The weight of flaxseed is gentle and comforting. Flaxseed pillows can also be chilled in the freezer to sooth fevers or slight inflammations, though they don’t get cold enough to provide the numbness needed for things like sprains and back injuries. Tip: I have been making these rectangular flaxseed pillows for a number of years now, and people are always surprised by how sturdy and professional-looking they are, and my secret is: only use the more heavyweight 100% cotton home decor fabrics. The lighter quilting cottons just don’t hold the heat as well, aren’t as comfortable to use and don’t last as long. 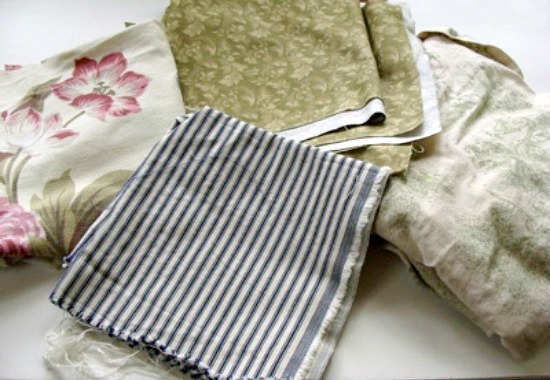 100% cotton, heavy-weight fabrics like ticking, florals, home decorating fabrics, and even denim (similar to the the fabrics pictured above). This is a key to making them a step above the run-of-the-mill flea market rice pack. Whole flaxseed (brown or gold), about 2 to 2-1/2 lbs for each rectangular warmer. If you can find whole flaxseed in bulk at a local store that will be your best deal. Online these are the best prices I’ve found at around $2 a pound: To make about 10 neck warmers- 25-lbs organic flax seed (even less with Amazon’s Subscribe & Save); OR to make just 2-3: Pack of 4, 24-oz. Whole Brown Flaxseed. 1. Make a pattern. This is optional, but If you’re going to be making a lot of these, it’s helpful. Make it out of brown kraft paper in any size you’d like. I find that a 12″ x 20″ pattern for a finished pillow of 5-1/2″ x 20 is a versatile size for draping around your neck, back or warming toes. It is easiest to cut only one piece that I fold before sewing. However, if I’ve got a piece of fabric that is close to that size I’ll use it, especially if it’s wider and shorter (like the red plaid pillow in the first picture) because that’s a nice size for using as a foot warmer. That size would be more of a square at about 14″ x 15.” Play around with sizes to find the one you like best- just don’t go too big or it will be too heavy and take too much seed to fill. 3. Sew the end and side seams. 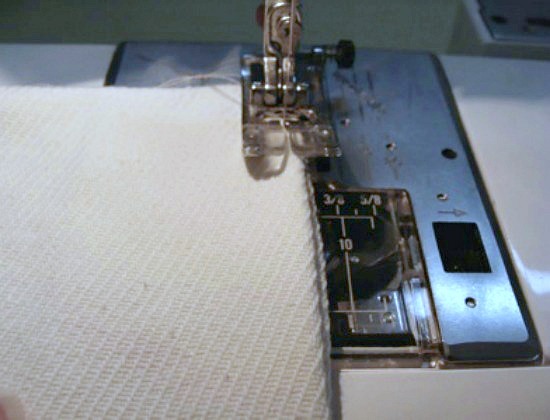 The sewing on this is super-simple, with a total of three straight lines. 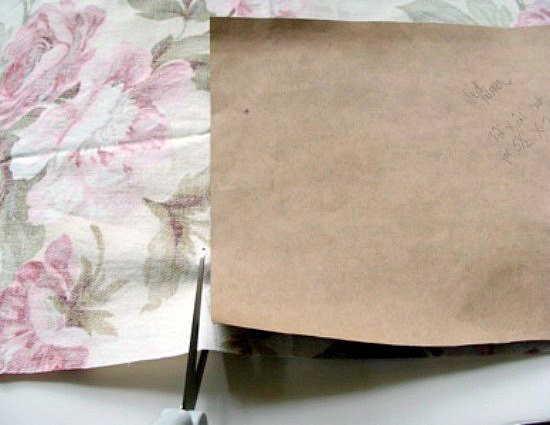 -Fold the fabric with right sides together and start sewing on one of the short ends (folded side farthest from you), keeping the edge of the presser foot at the edge of the fabric, as shown, for the seam allowance. 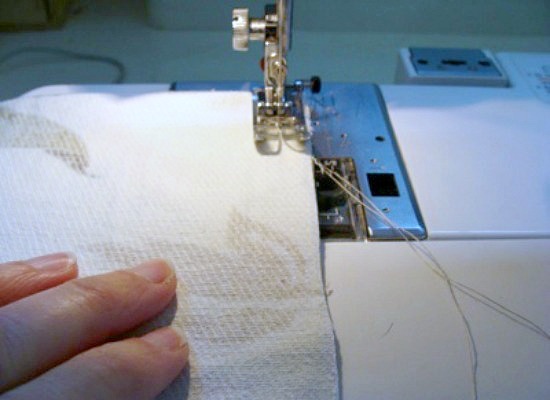 -When you come to the corner, make sure the needle is in the fabric, lift the presser foot, and turn your fabric. Lower the foot and sew all the way to the other short end, keeping the same seam allowance and ending at the open short end. It’s helpful to go back and forth a time or two (called “bar-tacking”) with the thread to lock in the seam, since we’ll be turning the pillow right-side out. 4. 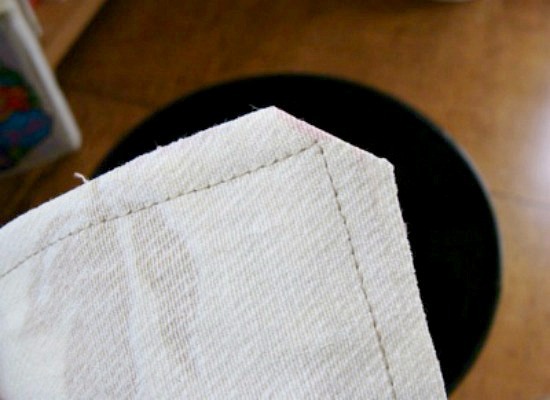 Clip the corners of the seams you’ve just sewn, as pictured, to reduce bulkiness when it’s turned. 5. Turn the pillow right-side out. 6. Fill with flaxseed and optional scent. Fill to between 1/2 and 2/3 full (depending on the fullness you want), about 2 to 2-1/2 pounds of flaxseed. This allows for movement of the seeds when heating in the microwave and for a comfortable pillow to drape (be careful, though, fill it too full and the pillow becomes like a rock…). Optional for scent: Add about 1/4 cup dried lavender buds. Lavender is a soothing scent that’s not too overpowering, so I find it works for lots of people. I’ve also used dried chamomile flowers. Alternately, a few drops of lavender essential oil could be rubbed into some of the seeds before adding to the pillow. Just don’t add too much scent, as it can be overpowering when heated. 7. Pin open edge. Fold the open end inward 1/4″ to 1/2″ and pin as pictured. 8. Sew the folded end close to the edge. Use the inside of the presser foot as a guide and lock each end by going back-and-forth with the needle and thread. You don’t want any seeds to fall out! Warm in microwave 45 seconds to 1 minute, shake, and warm another 20 to 30 seconds until desired temperature. Flax retains half its heat after an hour or more under covers and can be warmed again and again unlike grain products. Update! Go here to print off a set of tags for your pillows (and watch a video how-to if you’d like). And with flax seeds, a little fabric and lavender (maybe that you grew yourself? ), you’ve got a wonderful, inexpensive gift that people really appreciate. Have you ever made these for gifts? NOTE: this tutorial was originally published in 2011 and has been updated with larger photos and clearer formatting and information. How fun, Karen! Can you email me this question at [email protected] and then I’ll pass it on to my graphic designer daughter to see if she can do this? I just realized the flaxseed I’ve been buying to make these are whole roasted flaxseed. Do you think roasted flaxseed would be okay? Goodness, I didn’t know you could buy roasted flaxseed, Amanda! I have no idea if they will last as long as raw. I guess you’ll find out. 😉 You’ll probably get a better deal on raw seeds, so maybe look for those in the future? Hello, your insights into flax seed was very informative. Thought I would pass around that our local feed store sells flax seed for animal feed at $.71 a pound. There is a very small amount of stem in it, not even worth picking out. What a great resource, Sally! I hadn’t even thought to look there. Thank you! 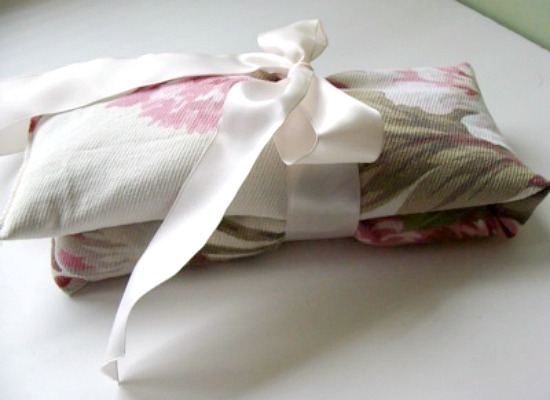 I am going to make a few of these as they will be perfect for my “hard to buy for” family members, that being said, I read your advised material to be heavy duty 100% cotton like decor fabrics. Clearly that must be comfortable or you wouldn’t use it owever I was wondering if you’ve tried or could comment on using flannel? I just love the feel of flannel and thought this would be a nice covering if it was a viable option. I would appreciate any advice you can provide. I will totally use your posted suggestion especially if flannel is a poor choice. Also, thank you for sharing as this really is something that everyone could use. I think you may be able to, but it would have to be a really sturdy flannel and be 100% cotton. You may think about making flannel covers instead as an option. Do you have a printable version of this I can print? Do you mean of the instructions? I don’t, Kristie, but that’s a good idea! In the meantime, you can copy and paste into a text file on your computer and then print out. Hi Jami, Thanks so much for sharing! I’m definitely making a few of these pillows for gifts as well as for my own sore neck. People tend to really appreciate homemade gifts. I really enjoy your blog and podcasts. Would the inside sewing of this project lend itself to serging? Thanks!! Is this project, internal seams, Serger friendly? You can serge the 3 edges before turning, Karen, if you’d like. The top seam is closed after filling, so that would be a regular seam. I have a flaxseed allergy. I cannot eat even 2 flaxseeds without problems. Would making an eye pillow using flax have the same negative allergic reactions as are caused from ingesting the seeds? I don’t know, Barbara, I’ve never thought about that! There’s no contact with the seeds, but maybe some oil we can’t see is on the pillow? You may want to stick with rice for your filler. Hi Jami, I tried your advice about the flax seeds It work great! Thanks for that advice! And now I’m asking how can this be heated if there are no microwave oven available? Can this be heated on tabletop gas range. Because What I thought was steaming the pillow but I think the seeds might get moisture. Any advise? 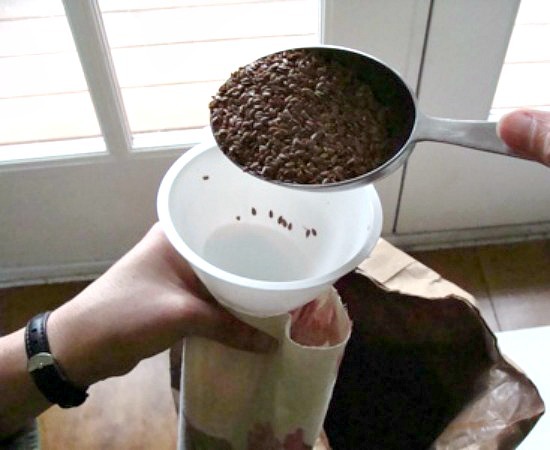 Do you microwave or freeze your flaxseed to kill any larva that may be in the batch hou buy? Could you add lavender epson salt, instead of the dried herb, to the flax for fragrance? I’ve never tried that so I don’t know. Any alternatives for Flaxseed for the dream pillows? I’ve heard of uncooked rice but would that be a good filler for dream pillows for example if we use them as giveaways? or if we’re looking to sell them for profit? People have used all kinds of grains for these pillows, but there are lots of problems with that. Which is why I prefer whole flax seed and recommend only that. Ahh I see, Thank you.. I just hard a hard time looking for flaxseed in my place and importing them would be a bit costly. Another question, Flaxseeds are edible right? are they still okay to use as fillers even if they expire? will the seeds still have a good texture for the pillows? — or Is there a Flaxseed variant that are not edible? Also I would like to add a lavander scent to the pillows. if the flaxseed gets soaked into essential oil will it absorb the scent? Yes, they’re edible – you can use them at any time in their life (I don’t think they expire for this purpose). I usually add dried lavender like I show here, but sometimes have used essential oil. I stir a few drops (10-15) into the seeds before adding them to the pillow form. It holds the scent for awhile. Oh. okay that clears things up more on my side. oh one more thing are flaxseed safe to microwave? and when you add essential oils do you let it stay soaked for some time before adding it to the pillows? Yes, that’s how I show how to heat the pillows so it’s all safe. I just add the drops to the seeds and mix them, no soaking required! 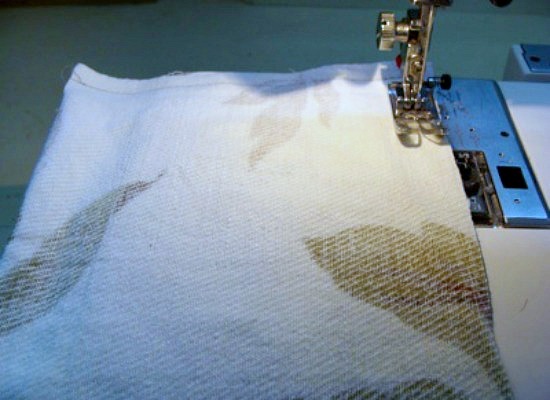 Do you wash cotton fabric prior to sewing? I don’t because these aren’t washable. If you want to make a cover for them (just make another the same shape, just 1/2-inch bigger all around), I’d wash that because it would be specifically for washing. Hi! Would poplins work for this? Anything that is 100% cotton and relatively thick work great. 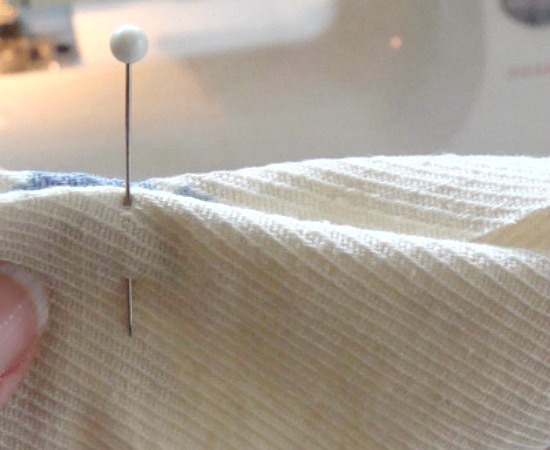 The thinner cottons used for quilting aren’t sturdy enough. We don’t have a microwave (got rid of it over a year ago) and have found that we don’t miss it. To heat my rice or flax pillows, use immersion! Think very hot water in a crockpot, using glass jars to warm the seeds (cover with lid loosely, so any steam buildup that could form can escape). It will take longer to heat, but this creates a quickly-warmed flax that can then be poured in reusable cloth or sacs that can be folded and pinned. Alternatively, I fill a 4-oz glass spice jar with frozen whole organic flax seeds, put in glass container or ceramic mug, and pour boiling water around it to heat it up. Shake and/or stir occasionally and the flax seeds will be warm. I often create these and put on lid. Of course, glass would not work for a young child, or you can pour into a pillow protector with a zipper and simply fold it around to shape (may need more flax. Of course, exercise care when heating up using hot water and glass, but this method works. The idea here is to heat the flax seeds without exposing them to water or steam (i.e. in glass) and then pouring those warmed seeds into a suitable container (like the zippered pillow protector case) that can be empitied, washed and reused–the seeds themselves can be re-frozen between uses. I know this is not for resale, or the pretty way you wrote about, or even for use with children, but for those wanting an alternative to rice (I got tired of the smell! ), with older families, this works great. My husband is currently using the glass spice jar method for his TMJ joint and it works great. I add a few drops of lavender essential oil, or in the summer, use fresh lavender or dried flowers. Thank you! I would open it and add the oils to the seeds, mixing around as much as possible, Karen. You only need a few drops (like 2-3), but it’s up to you. Just be aware that the scent is stronger when heated. Have you ever used ground flax seed? No – you wouldn’t want to because the ground seed would release too much moisture.